Q. What is the most popular eBooks database? The most popular eBooks database is called the EBSCO eBook Academic Collection @ Fuller library (EBSCOhost). It contains multidisciplinary subjects but you will find religion, psychology, anthropology, etc. ProQuest eBook Central is also a popular interdisciplinary resource. You can browse all of our eBook databases by clicking the Books and eBooks button on the library home page. 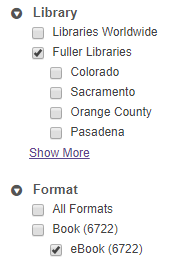 From here you can search the library catalog or click the icons for individual eBook databases. ﻿You can find lists of recommended databases (including eBook ones) for each Fuller school on our Research Tips and Techniques page.